Finding the gourmet in everyday means enjoying great food not only on special occasions but celebrating everyday with fantastic foods that can show off your skills and bring together fun and exciting ingredients to make a dish that would be fitting in any restaurant or bakery. My Dad builds homes and every home that he built for our family was always centered around the kitchen. This was the hub of our home and with six boys it was always busy. My Mom was a fantastic cook and I was the envy of my friends who often came over to sample from my mom’s amazing cooking. She was never hesitant to open her kitchen to her boy’s experimentation and most of my brothers are fairly comfortable in the kitchen. My earliest cooking memories include everything from attempting to make salt water taffy when I was 10 years old, to being forced to make cookies for a neighbor as a punishment. For the cookies, I chose the most disgusting recipe I could find in the cookbook, boiled raisin cookies! Unfortunately, they turned out great and everyone loved them. Challenging Techniques and Ingredients – I push myself and my readers to try new things. While I love to eat great food, half the enjoyment for me is the time I spend preparing and cooking it. When I have a craving I often spend a significant amount of time searching my trusted cookbooks and favorite on-line sites for multiple recipes. I try to pick one that seems to combine the freshest most unique ingredients and interesting techniques that will challenge me to create the perfect dish to satisfy my craving. Whether it be the process that goes into the perfect Risotto or the challenge of whipping and folding in egg whites for a light and moist lemon chiffon cake, there’s no point in cooking if it doesn’t challenge me to learn or try something new. Memories – This includes the memories associated with the recipes and the memories you make while spending time in the kitchen. Every week when I make my homemade white bread, I think back on both my Grandma and Mom and the memories of walking in after a day at school to the wonderful aroma of freshly baked bread and making sure I got a “heel” piece before my brothers ate them all. Perhaps even more important are the traditions I am now forming with my own family. I love having my boys sit around the island each week, helping stir together ingredients with me as I mix together my famous buttermilk pancakes for “Pancake Wednesday”, a tradition now for over 10 years! 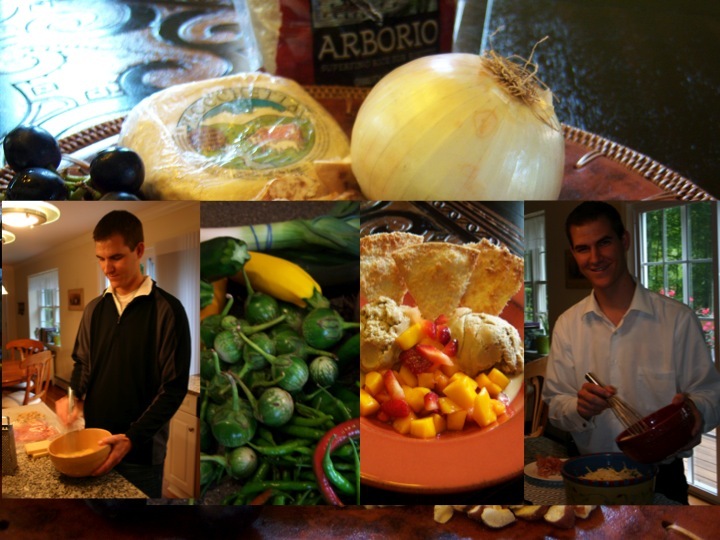 A Chance to Share – If I were all by myself I really don’t think I would cook as much as I do now. I love the opportunity to share my creations with my family and friends and I have to admit I do like and appreciate it when someone compliments me on my food. I love creating a wonderful meal and inviting a family to come enjoy it with us or showing up to a BBQ with some fancy appetizer like bacon wrapped asparagus and having people ooh and ahh over it. There’s just something special that comes from seeing someone enjoy your creation. Thyme in Our Kitchen is my way of sharing with the world. I chronicle my journey to find gourmet recipes that readers can use for special events as well as everyday occasions. They’re not always cheap and they most likely aren’t simple, but the excitement is in the adventure and savoring that first bite. Join me as I visit the farmers markets throughout Minneapolis, search the aisles of my local Thai and Indian grocers and peruse specialty cheese shops. Come back often and then take what you learn here and go start your own journey! Don’t forget to come back and let me know how things turn out for you. What a great post and the food looks delicious! Good luck! Great post! I enjoyed reading it! And I love your Pancake Wednesday tradition! Growing up, we had a similar tradition, except we had pancakes on Sunday!